Indexed in: Book Citation Index, Science (BKCI-S), Social Sciences & Humanities (BKCI-SSH), Scopus, EBSCO. Positive Approaches to Behavior Management: Friend or Beast of Burden for Professional Educators? If we joined staff and programs from the CMHCs with staff and programs from the schools, we could reach many more youth and we would help both the mental health centers and the schools in achieving their missions. This realization, and increasing strong collaborative relations with a great group of colleagues from multiple universities and youth serving systems in Baltimore and the state of Maryland, helped our team to develop the expanded school mental health (SMH) framework, involving a shared agenda (see Andis et al., 2002) of schools, families, and community systems working together to develop and implement a full continuum of effective mental health promotion and intervention for youth in general and special education (see Weist, 1997; Weist, Evans, & Lever, 2003). In the early 1990s we explored dimensions of effective expanded SMH in Baltimore, with an overriding emphasis on quality. By asking youth and families, school, community, and government leaders what they wanted in quality SMH, clear themes emerged of moving toward proactive, preventive and more flexible mental health care, delivered by committed and caring professionals who would eliminate bureaucratic barriers and work to rapidly provide help to youth in need (Flaherty & Weist, 1999). Immersion in this work led to an important opportunity to apply and receive funding for one of two national centers for mental health in schools in 1995, with initial funding from the Maternal and Child Health Bureau, which has continued through 2010 to support the work of the University of Maryland, Center for School Mental Health (CSMH; see http://csmh.umaryland.edu; www.schoolmentalhealth.org). It has been a great privilege for me to participate in the progressive development of the SMH field, and the CSMH, which has responded to thousands of technical assistance requests, held 15 national conferences on Advancing SMH, held 8 regional conferences on integrated school health and mental health services (the School Health Interdisciplinary Program), developed and widely disseminated over 150 documents and publications, and contributed to significant collaboration at local, state, national, and international levels (see the National Community on Collaborative School Behavioral Health, www.sharedwork.org; the International Alliance for Child and Adolescent Mental Health and Schools, www.intercamhs.org; the international journal, Advances in School Mental Health Promotion, www.schoolmentalhealth.co.uk). Mental health programs and services in school have been around for a long time (see Sarason, 1996), but the norm has been for specific disciplines operating in schools, often without a lot of interaction, and often with constraints on their positions. Citing two examples, in spite of the fact that many have training as mental health professionals, school psychologists and counselors are often constrained into roles emphasizing evaluation and academic advisement (respectively), training and support for these staff members are often limited, and ratios of these staff members to students are far below those recommended by professional associations (see Flaherty et al., 1998; DuPaul, 2007; Weist et al., 2007). In contrast, the SMH field emerging and gaining strength in the last two decades emphasizes on an interdisciplinary and inter-systems (e.g., education, mental health, child welfare, juvenile services) approach that is actively guided by youth and families, and other key stakeholders such as teachers and community leaders (see Lever et al., 2003). While the research literature is still developing, advantages for SMH are being documented, including improving access to care (Burns et al., 1995; Catron, Harris, & Weiss, 1998; Rones & Hoagwood, 2000), enhancing preventive services (Elias, Gager, & Leon, 1997; Weare, 2000), increasing early problem identification (Weist, Myers, Hastings, Ghuman, & Han, 1999), decreasing stigma (Atkins, Adil, Jackson, McKay, & Bell, 2001; Nabors & Reynolds, 2000), and increasing generalization of intervention impacts across settings (Evans, Langberg, & Williams, 2003). The federal government in the United States is providing significant support to the SMH field (see Anglin, 2003) through major policy reports, including Surgeon General’s reports on transforming mental health and children’s mental health services (U.S. Department of Health and Human Services, 1999; U.S. Public Health Service, 2000) and the Achieving the Promise Report (President’s New Freedom Commission, 2003), which emphasized SMH services as one of 19 prioritized recommendations (recommendation 4.2). There are also many federal grants supporting SMH, including those focused on Systems of Care (led by the Substance Abuse and Mental Health Services Administration [SAMHSA]), Safe Schools/Healthy Students (led by the U.S. Department of Education [DOE] and SAMHSA), Mental Health Integration into the Schools (led by DOE), Capacity Building for SMH (led by the Centers for Disease Control and Prevention), and strong support for SMH research from the National Institute of Mental Health, and the Institute for Education Sciences. Indeed, in the U.S., school mental health programs and services are showing progressive growth, even in these economically challenging times. However, in spite of this progress, there is much to be done, in building the research base; and increasing implementation support for high quality, evidence-based practices (see Evans & Weist, 2004; Fixsen et al., 2005; Weist et al., 2009); broadening training opportunities at pre-service and in-service levels, especially effective interdisciplinary training that embraces principles of adult learning (Mellin, 2009); building policy support for SMH (Weist et al., 2007); and increasing connections among training, practice, research and policy realms (Paternite, Weist, Burke, & Flaspohler, 2008). There is also a critical social marketing agenda to pursue increasing public awareness and involvement in the SMH agenda, supporting work that promotes students’ wellness, reduces academic and non-academic barriers to their learning, and increases the likelihood of academic and subsequent career success. To promote progress in all of the above there is a need to broaden the knowledge base in the field and to promote collaboration among the diverse stakeholders who have a vested interest in improving and expanding SMH (see President’s New Freedom Commission, 2003). To that end, I am very pleased to provide the introduction of this book published by Bentham Science, and edited by leader in the field, Raymond J. Waller. 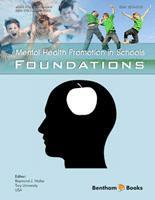 This book, the first in a series and focused on Foundations, will be an important resource in the compelling school mental health field. Wide agreement exists among those in mental health and allied fields that mental health needs are increasing and that needs far exceed the resources needed to address them. This is true, perhaps especially, for children. This public health tragedy is made more poignant by virtue of the availability of effective interventions for many mental health conditions. Even if the resources were obtainable for the treatment of those with mental health conditions, however, successful intervention does not prevent the stigma, syncopation in development, social isolation, cost incurring, and other potential negative outcomes associated with both the conditions and the labels applied in the process of typical treatment. Prevention of the incidence of these disorders (primary prevention) is thus clearly preferable to treatment (secondary prevention) or amelioration (tertiary prevention). School already promotes, and some would contend in a manner consistent with the quality commensurate with best practices, health and health behavior. Broadening this endeavor to include promoting mental health is a manageable, though logical, modification to current goals and curricula. This book, the first in a planned series, includes issues and considerations deemed to be fundamental in successful mental health promotion in the school setting. The scholarship of experts and premier practitioners has been sought in providing the most progressive knowledge currently prevailing throughout in the area. There are now professional journals dedicated to the topic (e.g., Advances in School Mental Health Promotion) as well as prestigious centers of research and practice (National Center for Mental Health in Schools at UCLA and Clifford Beers Foundation). There are likewise numerous texts on the subject (e.g., Waller, 2006). However, this book and the subsequent installments in the series are believed to be unique in the scope offered in one resource, though there are undoubtedly numerous topics of importance that are not covered. In any case, the topic is worthy of the level of attention it now receives, but in dissemination of the current state of the knowledge base and in the continued inquiry into the gaps in what remains unknown. Continued investigation will uncover unknown and ensure that needs and best interests of children are supported by the best research, policy, and practice that society can offer. It is fair and right to acknowledge the help, assistance, and patience of Miss Asma Ahmed at Bentham Science eBooks, who has supported and guided this project from the outset. It is likewise imperative to thank, with a heart of respect and appreciation, the scholars and practitioners who contributed their time and expertise, with little offered in return except a means to further disseminate their valuable work and my personal gratitude.